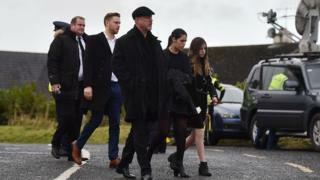 The funeral of Cranberries singer Dolores O'Riordan has taken place in County Limerick. The service, led by family friend Canon Liam McNamara at St Ailbe's Church in Ballybricken, will be followed by a private family burial. Some Irish radio stations simultaneously played the band's 1996 hit, When You're Gone, after the midday news.
.@IBIreland & @RTE2fm will pay tribute to @The_Cranberries Dolores O'Riordan today by simultaneously playing "When You're Gone" after the midday news. Ms O'Riordan died suddenly in London last week, aged 46. At the beginning of Ms O'Riordan's funeral Mass, a guitar and a platinum disc award were brought to the altar as symbols of her life, as well as a picture of Our Lady Dolours, after whom she was named. During the homily, Canon McNamara said "the numbers she rescued from the darkness of depression are impossible to count". He recalled the first time he met Ms O'Riordan, telling the congregation that the memory was "indelibly written on my mind". "There she is, sitting at the keyboard, playing and singing with the choir in this lovely Church of Saint Ailbe," he said. He said Ms O'Riordan had "reached out to the world" and had "a unique respect for everyone". "It is our sincere prayer that our beloved Dolores is now re-united with her father, Terry, her baby brother, Gerard, grandparents, relatives and friends, in the presence of the Lord and Our Lady of Dolours in the heavenly kingdom, where there is no more pain or suffering or separations, but only joy and peace for all eternity," he said. "If tears are shed in heaven - by necessity they are tears of joy. "Yes, tears of joy, following an excellent performance by Dolores, in the most important and vital gig of all - the gig of life itself." Canon McNamara offered sympathies to Ms O'Riordan's mother, father, her children and her Cranberries bandmates. Hundreds gathered to pay their respects in her home city of Limerick over the weekend. Candles lit the streets of her native Ballybricken on Monday, as her coffin was brought to St Ailbe's Church, where she once sang in the choir. The Irish President, Michael D Higgins, also visited to sympathise with the late singer's family, describing her death as "profoundly sad for one so young". Image caption Dolores O'Riordan died suddenly in London last week, aged 46. Ms O'Riordan will be buried beside her late father, Terence, in a private ceremony in nearby Caherelly cemetery following a funeral Mass. She was discovered unresponsive in a hotel room in London on 15 January. It has now emerged she was due to discuss a new Cranberries album with her record label during her trip. Her publicist issued a statement saying that while she had been in the city for a studio mixing session with her other music group, D.A.R.K., she was also due to meet representatives of the BMG record label "to discuss plans for the release of a new Cranberries studio album". An inquest into O'Riordan's death, held at London's Westminster Coroner's Court, has been adjourned until 3 April while the coroner awaits test results. The singer, a mother of three, was renowned for her distinctive voice and enjoyed huge success with the Cranberries in the 1990s with tracks including Zombie and Linger. The Metropolitan Police have said they are not treating her sudden death as suspicious.